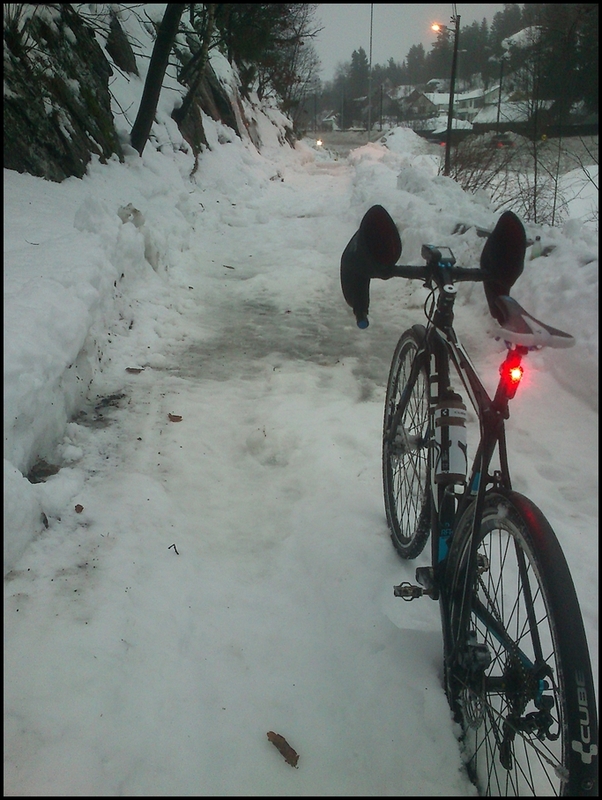 This year I had decided that I would not participate in the festive 500 and I sold my trusty cyclocross. I still needed a bike to get me to work and I got a great deal on a steel singlespeed that had been stood around the shop for 4 years. I fit slightly heavier gears 32-16 and I found that I could reach 24km/h spinningly on the flat and just about make it over the steepest hills on my daily commute. The reason why I wasn`t going to do the 500km`s during the festive season this year is because I wanted to dedicate more time to my 2.5 kids, wife and 2 dogs but my wife, it seems, had taken it for granted that I would be out pushing the miles and burry myself on Strava and intagram anyway and encouraged me to do it this year too..... 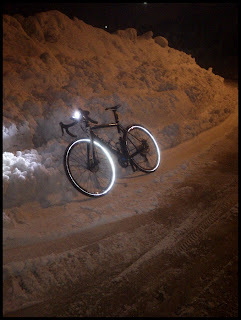 So it was decided that I would do it on my dedicated singlespeed winter bike because its just not possible to ride in our conditions on a road bike. 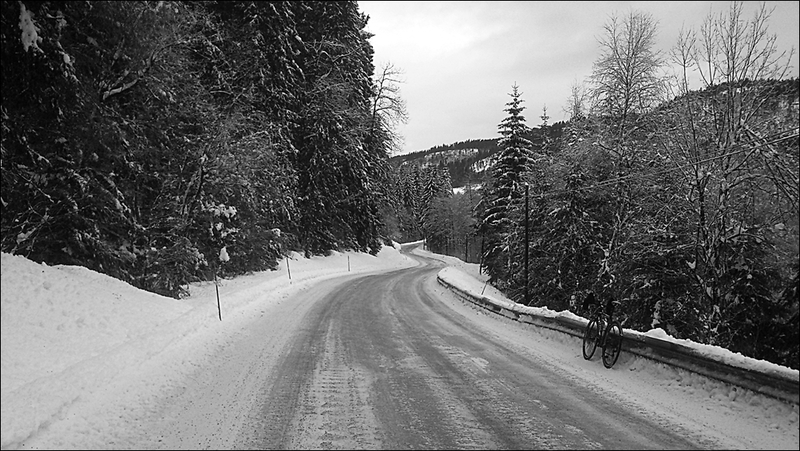 I have read a lot of reasons why people do the festive500 and the usual suspects are, base miles, getting out in the elements, a challenge, etc. but for me the way I view the festive500 has changed. 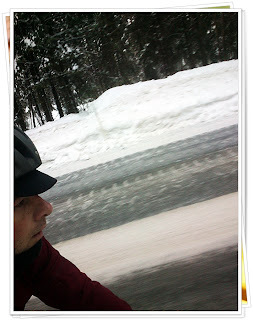 For me, the festive500 is the closest I`ll ever get to winning the tour de france. Well, that's a bold statement I hear you mutter and to a point I agree but just bare with me while I explain. 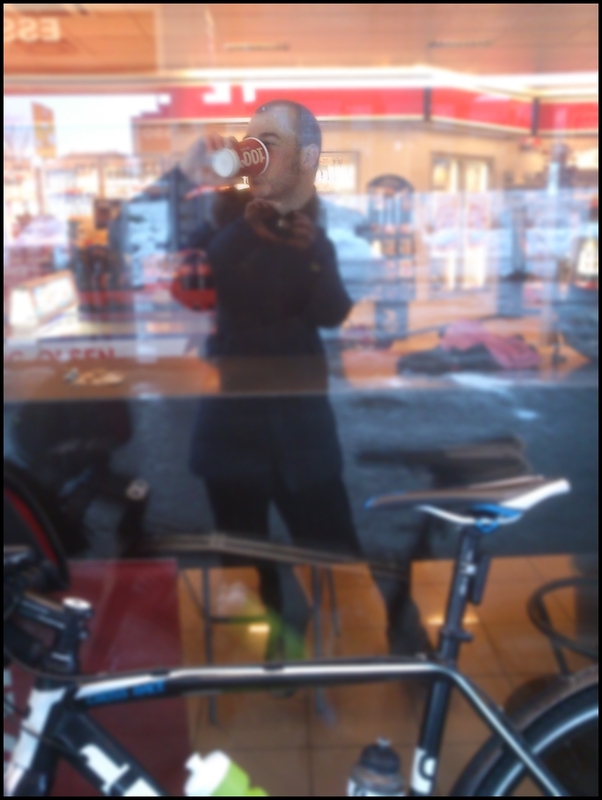 I`m a middle aged bloke that doesn`t compete anymore and just enjoys riding my bike, be it a moutainbike, road bike or whatever... I love to get out and ride for no reason than the riding itself. 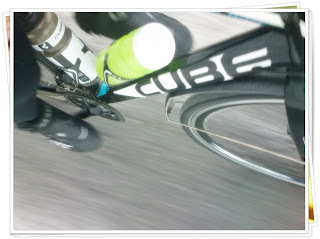 No goals, no pressure, no hunting for extra watts, or lower BMI, just riding for riding's sake. Now, the reason why I compare the challenge to the tour de france is the overwhelming support and encouragement I have recived over the last five sucsesfull attempts. Every time I stop , take off my gloves in freezing weather and take a picture, I know that someone else, be it from Japan, Germany,Australia or the USA will be encouraged to keep going and also write supportive comments on both instagram,facebook and Strava. Just the fact that I , a normal bloke with a bike can help motivate others to get out and ride more is mind blowing. Going back to the plot, how many middle aged blokes in lycra get so much attention for simply just riding their bike? I have even made friends with the guys and girls that I have "digitally" met under the festive500 and even virtually met some people just to go for a ride. This year I have had visitors to my house, complete strangers that have become riding partners and I also travelled to Germany to an obscure and literally unknown radmarathon in the black Forest to do what I love doing the most.....getting out in the elements and simply riding a bike. 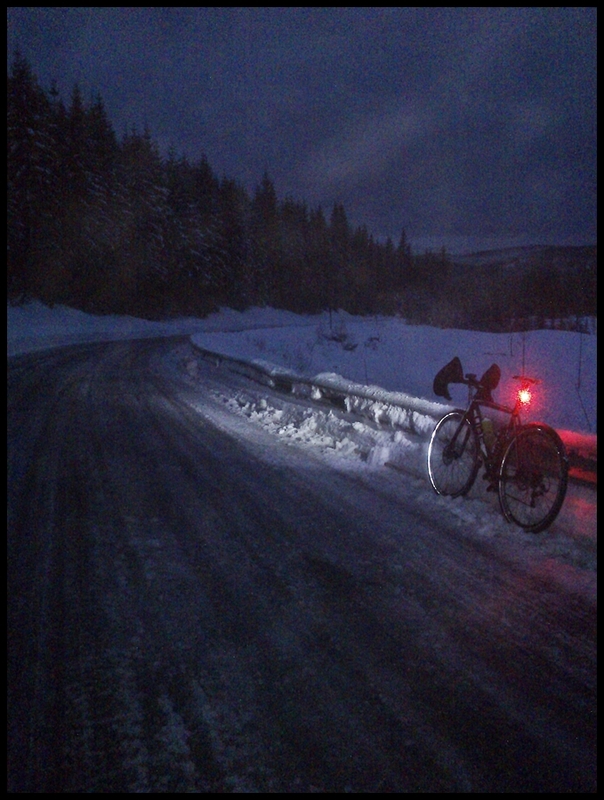 As you may have guessed, I completed this years Festive 500 on my singlespeed 29`er and I realy encourage other to give it a go. It`s not about how tough you are (the tough guys are doing over a 1000km`s ) , for me its about the global cycling community, all pulling together and cheering each other on. I think the guys a Rapha created something more that they originally expected. Chapeau! And see you next year. 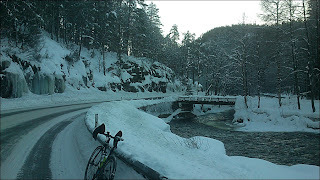 Its that time of year where I dust off this "blogg" to share my festive 500 escapades. 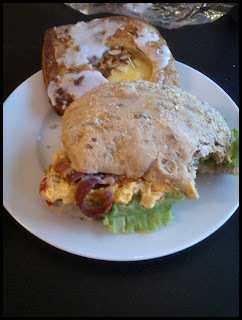 This, being my 4th Festive 500 means that I know what it takes to be able to complete the challenge. With this in mind I actually got in some base miles in November and I decided that I would plan my routes through places that I could take some interesting pictures even if it meant a lot more hours in the saddle through some of the toughest conditions,temperatures and climbs we have down here in the coastal area of southern Norway. 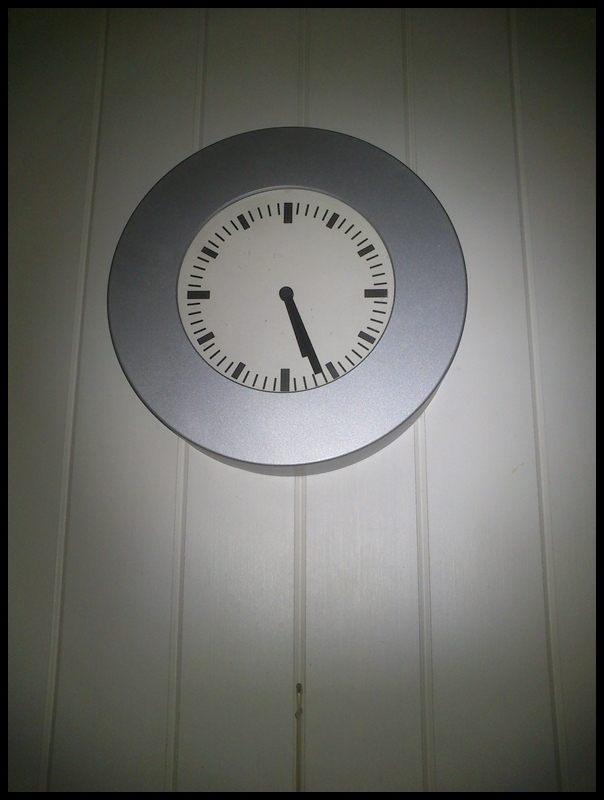 To be sympathetic to my family I decided to set out so that I would always be home at the latest 12 noon. My kids are a little older now and that meant spending valuable christmas time together at the breakfast table. This meant some very early starts and 4-5 hours in the dark. This also meant that, weather permitting, I should capture some nice sunrises and nice lighting conditions that only artic winter could produce. After my November miles I worked out that I would have to struggle in the snow and ice at around 18-20km/h, any faster just isn`t possible. On the hills I couldn`t stand or the back wheel would spin and downhill I just didn`t dare riding fast and on some days the wind chill factor was literaly unbearable at higher speeds. I`ll throw up some stats here first and post some pictures at the underneath. 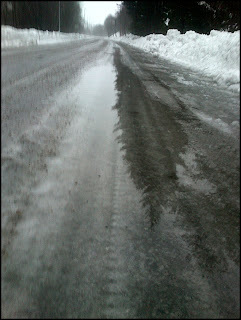 Lucky for me there was almost no wind, no mechanicals, no punctures and only a couple of low speed tumbles. I set out hoping to find a little adventure and Wow, what an adventure this year proved to be. I have had some great rides, 2 of which were 130km long. I had to dig deep sometimes but the rewards were well worth it. 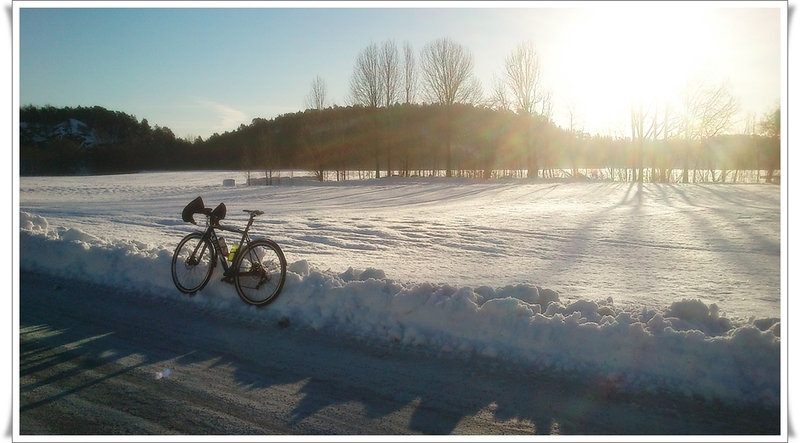 Before you look at the pictures, please bear in mind that it took on average about 20 minutes of riding before I could feel my fingers again, albeit stingely so I just wanted to take the pics fast and get my gloves on again. Thanks again for the motivation Rapha and Strava. See you next year. Its -15 Celcius and dark. 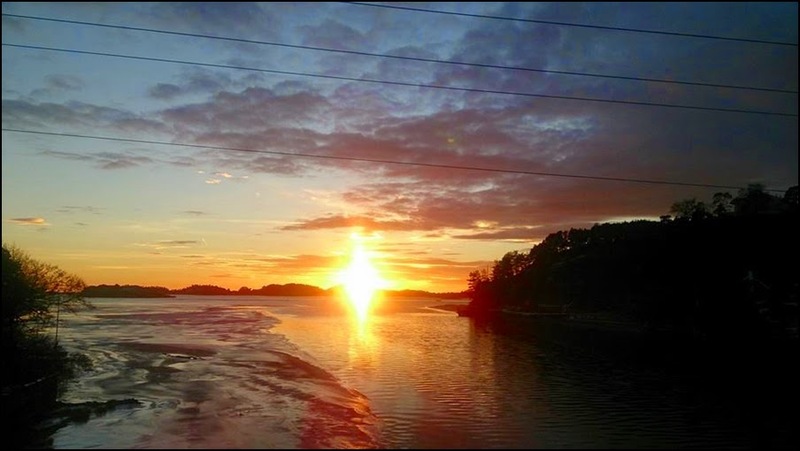 The sun slowly appears over the horizon and although the only warmth it produces is warmth in your soul, its just feels great. As you might work out by the above statement, I have made the 500km mark. 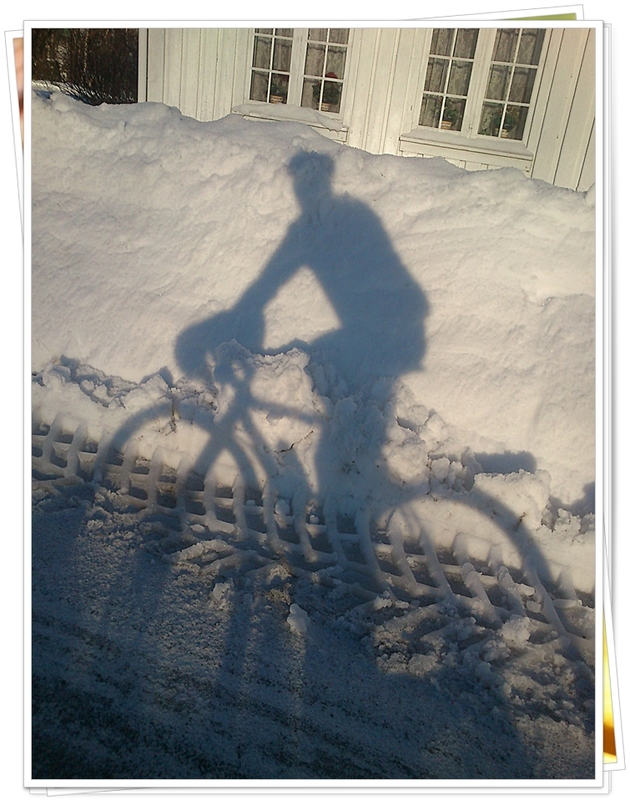 I have promised my wife that I will make reindeer stew for all our guests we have invited to celebrate new years tomorrow, so I decided to bag the the last 70km`s this morning, giving me time to peel spuds and stuff tomorrow. When my alarm went off at 06.30 today I really struggled to get my weary body out of bed, especially with the fact that i could hear hailstone battering down on the bedroom window. I consequently pulled the duvet back over my head but with a helping elbow from Anniken I finally managed to roll out of bed at 07.30. 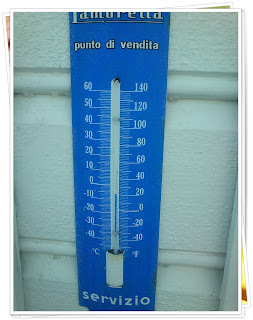 The temperature outside was -2 degrees and the sleet/hail had died somewhat. 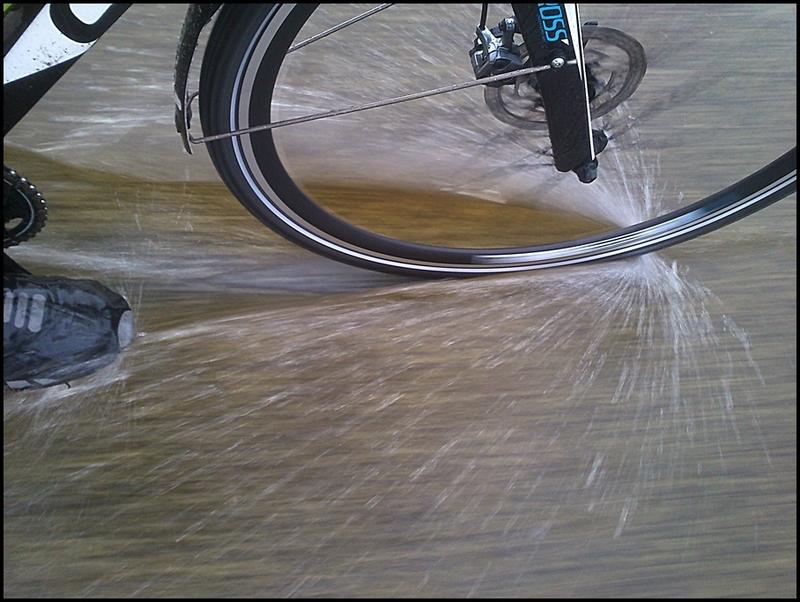 Today I decided that I would just ride a loop around my village on the roads that were almost ice free that I had spotted yesterday. The loop is 7.5km`s long and I would have to ride it 10 times to get the needed km`s. After round nr.2 the storm eased off a little and I found a photo opportunity. Not soon after I shot the picture, the skies turned black again and the sleet returned and the wind picked up. I was pretty miserable by round 5 and stopped at the local petrol station for a coffee. I grabbed a customer and asked her to take a picture. The result was my head inside, and her legs outside. The ice on the roads was almost completely melted where the car tyre tracks were, so I could either chance riding on rotten slush, or a gully full of water. It was raining so much at this point that I kept my wheels firmly in the gully and put my head down. " I am not wet, or cold", "I am not wet, or cold". 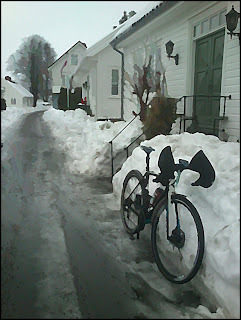 "Only 20km`s and I can get a shower" were about the only things I thought about round the last few laps of Søgne. 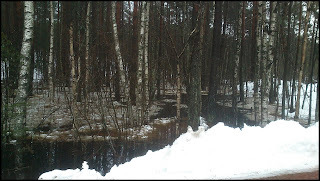 The ice and rotten snow was blocking the escape routs for the accumulated water mass. Hehe. 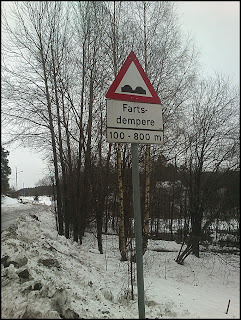 Childish i know but these signs still make me snigger. 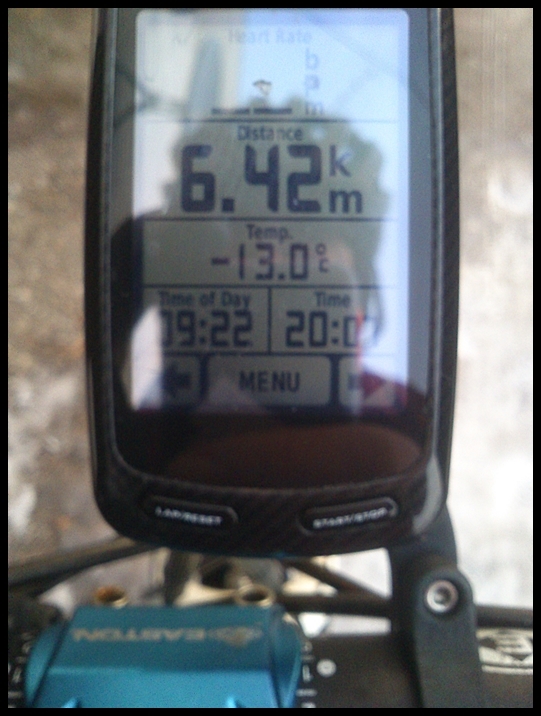 Iv`e spent 31 hours 32 mins 54 seconds out on my bike, 26:6:03 of actual moving time. (a lot more than last year, even though i`m a little fitter) and My 2 minutes of fame being that i was on top of the Norwegian leader board on Strava when I uploaded my final ride, with one less ride than my "rivals".Brilliant! This has got to be the best base mile week I have ever had, so if i doesn`t help me out next racing season, I really am a basket case! Thanks go to Strava, Rapha and my family for the motivation. 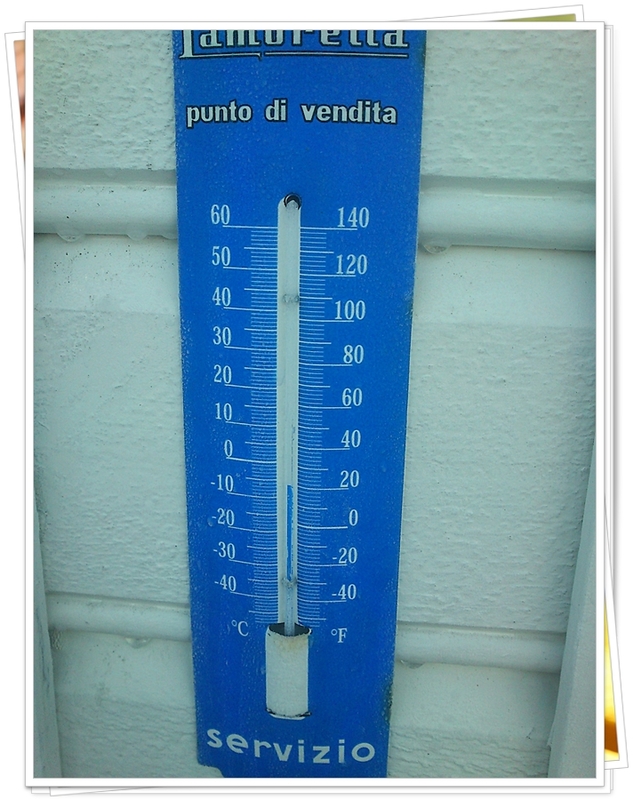 One of the Scandinavian weather traits is how fast the temperature can rise and fall. Most people who ski or climb mountains know that extra dry clothing is a must. I say this because after riding in -13 Celsius yesterday i woke up to rain and 6 Celsius today, that's a whopping 19 degrees difference in just 6 hours. 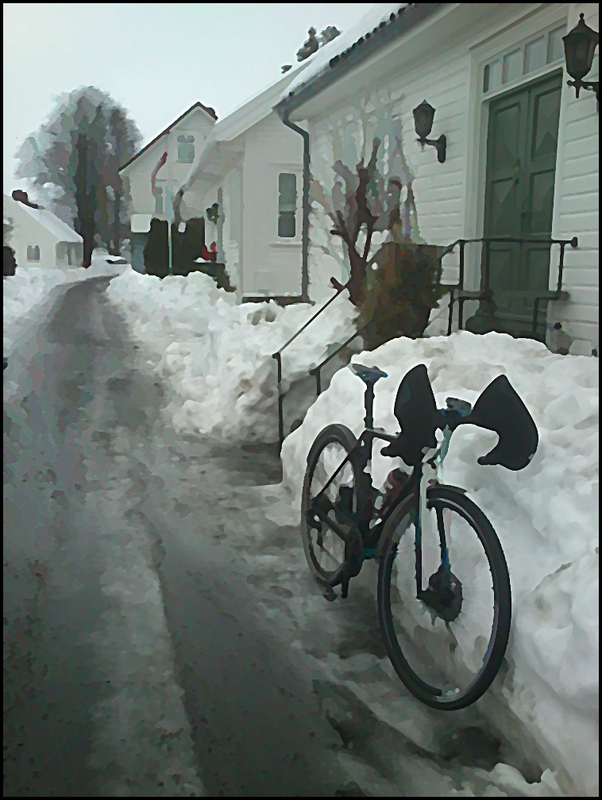 I had planned to ride about 50km`s but had to cut the journey short because although I don't mind most weather, being reduced to have to walk my bike just rubs me up the wrong way! Especially on the bike paths that are right beside a road that is totally snow and ice free. Arrgghh! The reason why it annoys me is that the government are all pro-cycling. They love campaigning to get more people on a bike and out of a car, especially commuters. The problem is that although they love us in their campaign, they simply don't look after the cycle paths... OK, rant over. Sheet ice with rain on the top. A bit of a nightmare to tell you the truth. 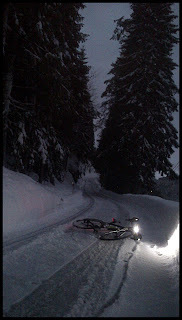 I didn`t fall today so I put it down to my Schwalbe marathon winter tyres. Top dog for winter commuting and training. Did I say I hate walking my bike? 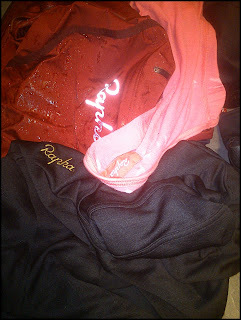 I got a Rapha hardshell off my wife for Christmas. A really good jacket for the rain but I have to say that my soft shell is still my all time fave. Today it was a fresh -13 Celsius when i set off, and the temperature sank down to -15 Celsius before rising to around -7 during the day. I was worried that my bum was going to hurt today but I used loads of rapha chamois cream, and it really does work wonders. 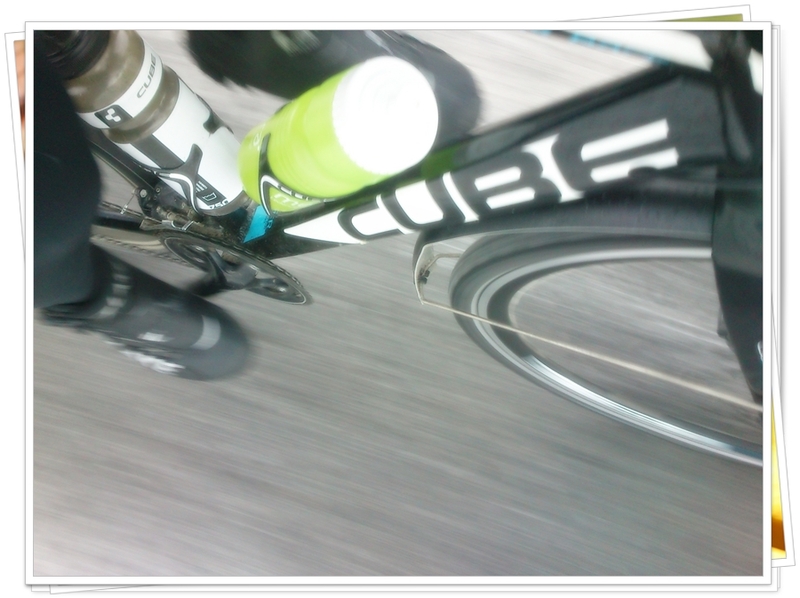 Legs were good, but we didn`t get any sun today. 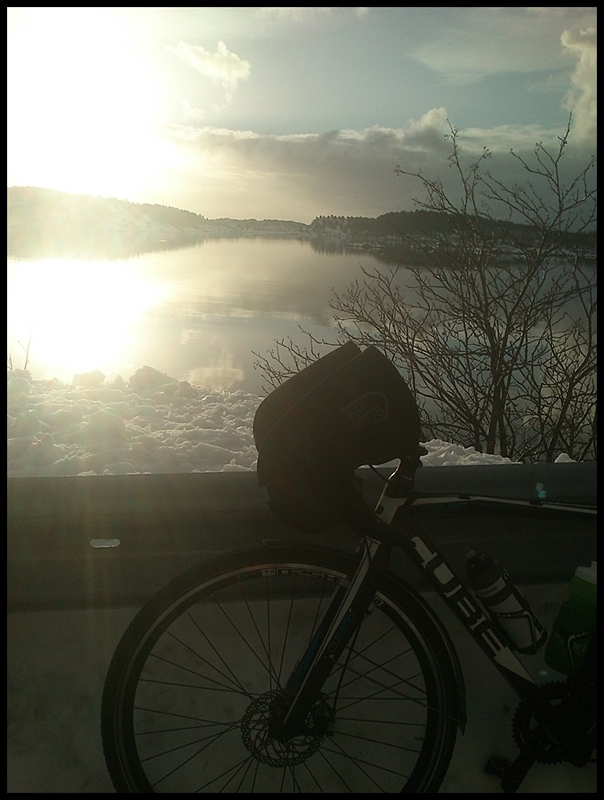 I am amazed that I managed to do the whole 160km`s today and I am well on my way to completing the festive 500 challenge. Unfortunately, Garmin stole another 30km`s (so, no, it isn`t a myth that Garmin Edge doesn`t work too well at low tempratures). 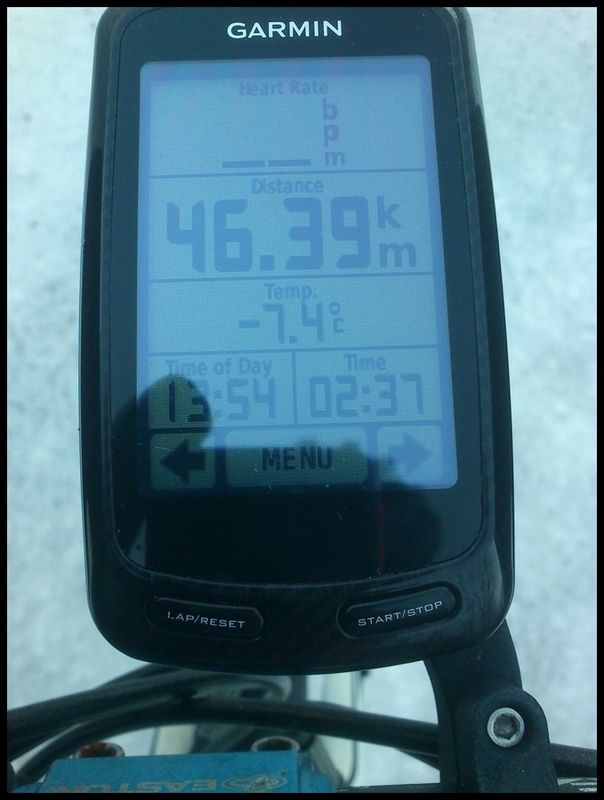 This ride gave me 160km`s during last years Festive 500 but it was warmer last year. Never mind, I suppose its only fair to the other arctic riders out there that we a playing on a level field. I hit the most spectacular scenery when the temperature gauge was at its lowest, so unfortunately I didn`t fancy taking off my gloves 60km`s away from the nearest place to get warm again. Although this was my longest ride, I took the fewest pictures. 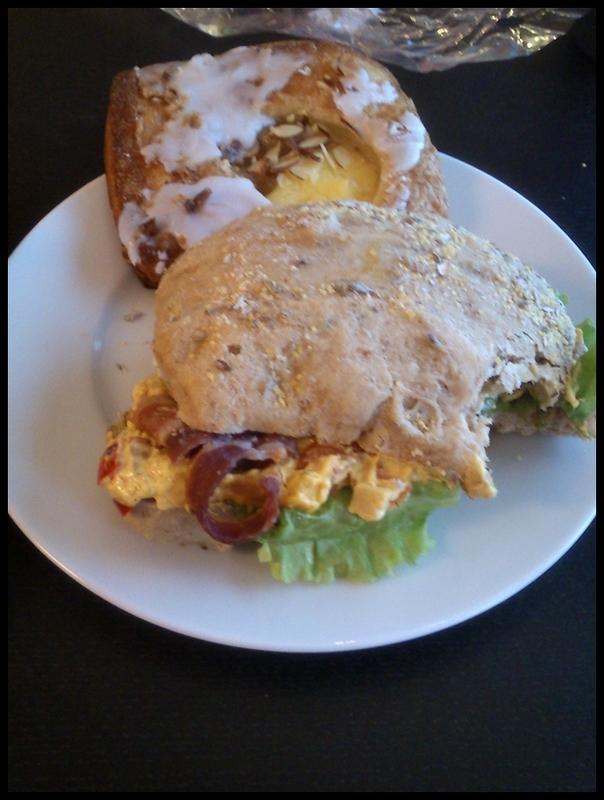 Lunch bought at my half way point, whist I had a little de-frost. So, according to my strava log found here , I did "133km`s" today and have racked up a total of 388km`s on my four rides. Average speed is off because of the missing km`s but moving time of 7 hours and 12 minutes is correct. I had a few more stops than I planned, simply to de-frost my bottles. I have tried to rally some support from fellow riders but to no avail, so it looks like it will be a 100% solo affair this year for me, Billy no mates.... hehe. I`m such an idiot sometimes! 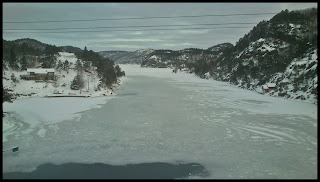 Yesterdays mini thaw, was joined by today's deep freeze. This made the roads really scary. I broke with my front disk brake going over some washboard ice and fell flat on my face and bent my front mudguard so it dragged on my wheel which I just bent back in a manner of fashion. 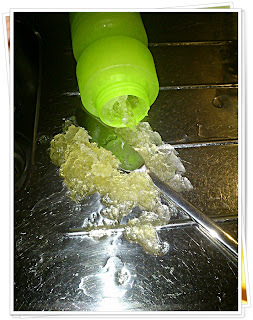 The nice thing about ice is that it is really forgiving if one should have hiccup. No damage to me or clothing as I slid about 10 metres on my side. Anyway, it gave me a scare so I took the rest of the day gingerly. The roads were very icy so I had to keep my bum firmly on the saddle on the climbs for traction and what turned out to be 60km`s of washboard gave my wrists and bum a real pounding....So i`m sitting on one cheek while I type. I had a few scary moments and I used these as photo opportunities. 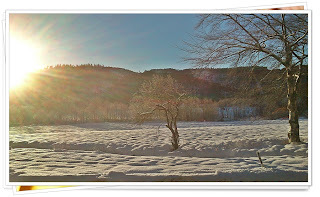 The weather was gorgeous, the sun was out, the wind was kind and the temperature varied from -7 Celsius down to around -9 Celsius in the shade. Like I said, I took loads of pictures, so without further ad do, here they are. Bent front mudguard. These Lake winter shoes are a godsend. 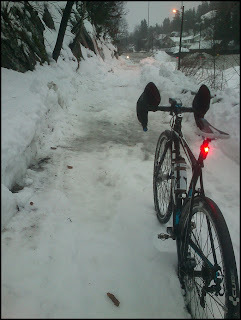 Today I used Rapha`s deep winter tights, as I normally do all winter. Mugshot. 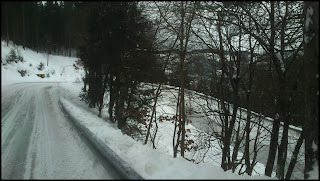 I was really pleased I got a shot of the gnarled bumpy ice created by the ploughs with snow chains. The largest dilemma of the day was, do I (a) stick my freezing water bottle up my jacket to prevent it from freezing or (b) just don't drink. I opted for the latter and ended up with a headache. Doh! All in all, I just plodded around taking photos and enjoying the beautiful weather today. Now I`m at the halfway point, and really hoping I can complete the challenge. Well happy. The strava log for today is Here. Another early start and today I was determined to get in about 120-30km`s. 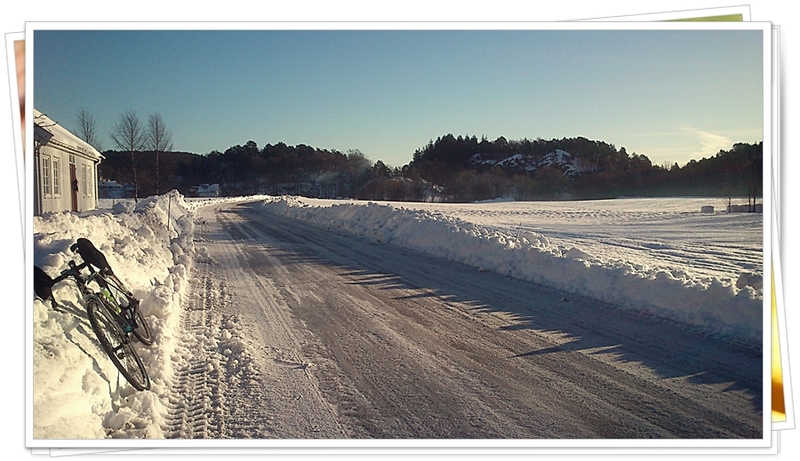 I was expecting pretty hard going because we have had a mini thaw. Just enough to soften up the top layer of snow but not enough warmth to thaw the ice under the snow. I encountered a myriad of challenges and conditions. 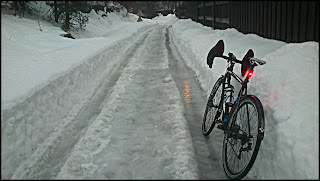 I got about 80km`s of sheet ice with a thin layer of water on the top, 30km`s of 20cm deep slush, I encountered some sleet and right at the end of my ride I got rain and actually saw some black asphalt patches even though the mercury was telling me it was -3 celcius. Not really the worst place to fall on my face, although trying to get hands out of Bar-Mitts can be troublesome. It`s a bit like the good ol`SPD fall, but with your hands, instead of your feet. I love this shot! 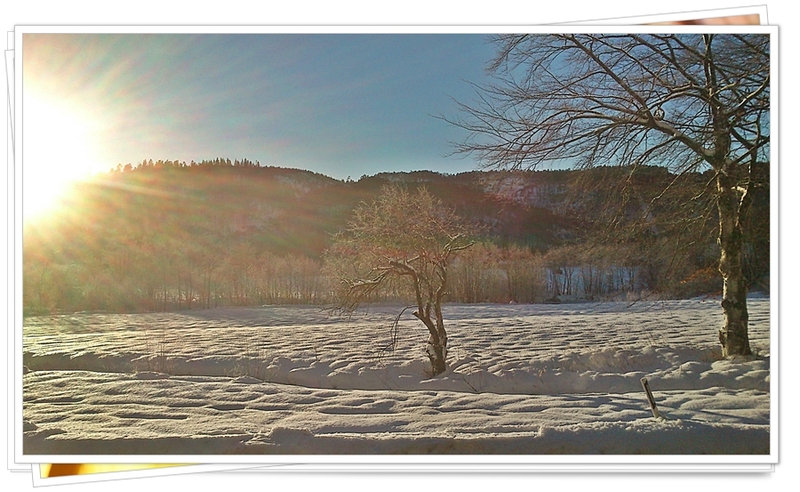 40km`s from home and the sun is just peeking through the mist. 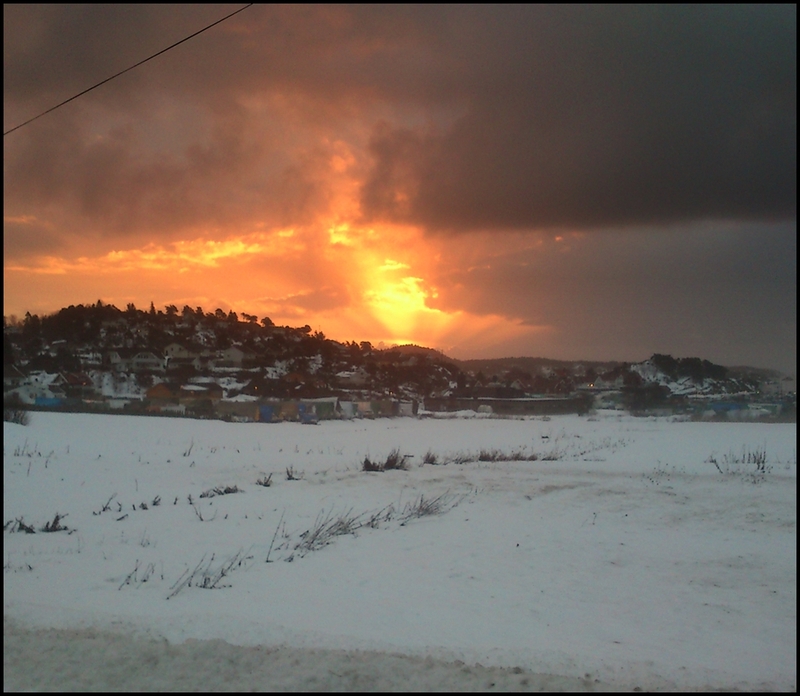 Another shot, about 20km`s from home. 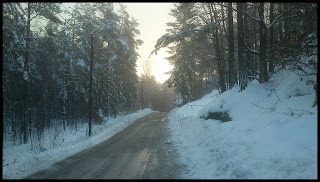 The blurry effect isn`t something I have added but as mentioned on the above pic, It was pretty misty. The going was painfully slow today but I decided not to let the speed bother me and just get my head down and do the miles and keep my studs facing terra-firma as much as possible. 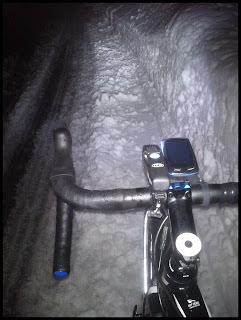 One thing that does bother me slightly, is my Garmin 800 got the holes under it, blocked by snow. 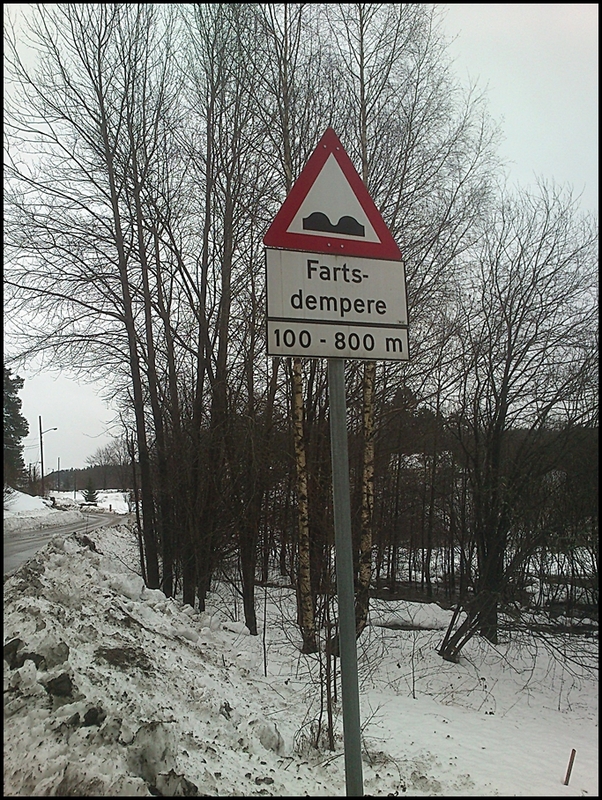 This ride is normally 128km`s long with 2200m of height gain. Today Garmin gave me 571m of height gain and only 108km`s. Still, chin up! over a 3rd of the challenge complete. Yay!